For northerners, a snow day is just, you know, a normal Tuesday, but here in the south, it is an event. Schools and businesses close, roads become impassable for days, and life basically just stops. I was just remarking to Greg a few weeks ago that nothing has interrupted our life for awhile now. That’s actually a really good thing, because it means that we have had no sickness or tragedies to deal with. However, there is something nice about all your routines coming creaking to a halt for a few days, when it doesn’t involve ill health or tidings. And so, when I woke up on Friday to flakes pouring from the sky, I rejoiced along with my children. They were celebrating the possibility of sledding and snowmen, while I was celebrating a break. Because that’s what snow days are. 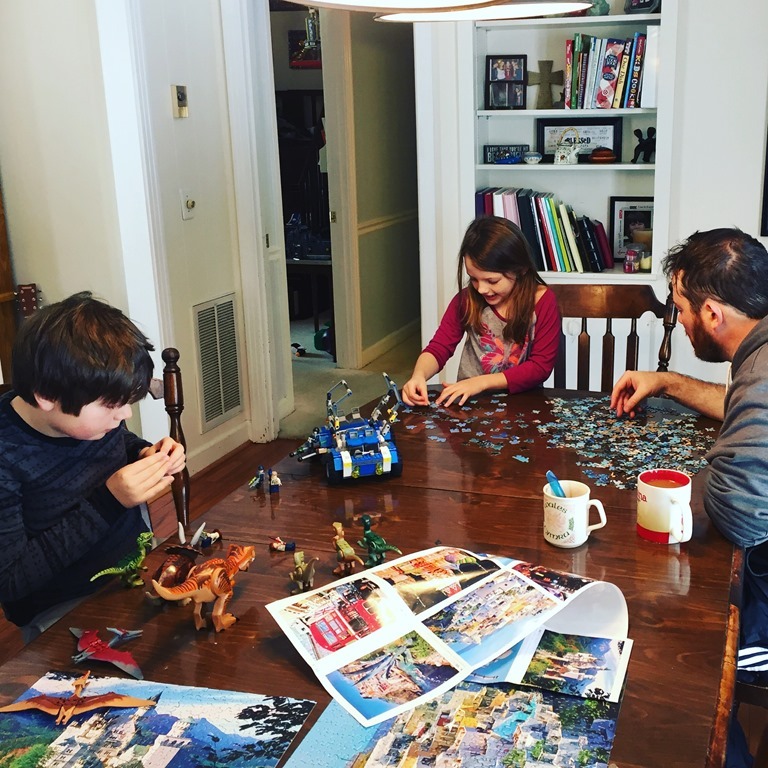 They are a kind of weather-induced Sabbath, where we get to stay put for awhile and just “be.” They remind us that we are not all-powerful, we with our roads and our vehicles and our never-ending to-do lists. They open our eyes, yet again, to the fact that the world does not stop spinning just because we stop being productive and simply enjoy our lives for a little while. In some ways, snow days teach us a hard lesson because they remind us of our own finiteness, our limits, our levels of impotence. But they are also a blessing, in the way that anything that opens our eyes to the truth of our existence is a blessing. 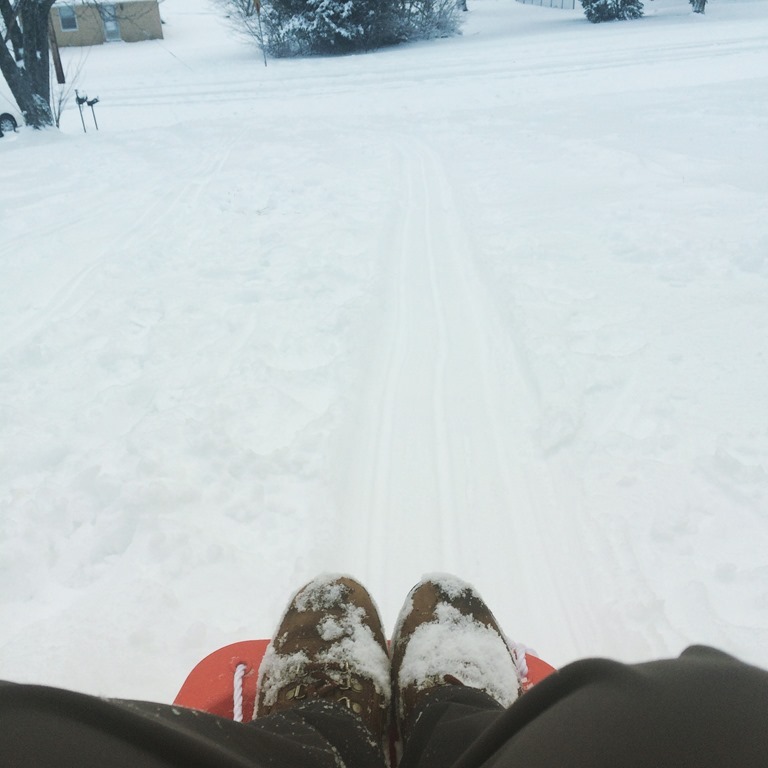 And so instead of working or teaching or doing schoolwork, our family goes sledding. 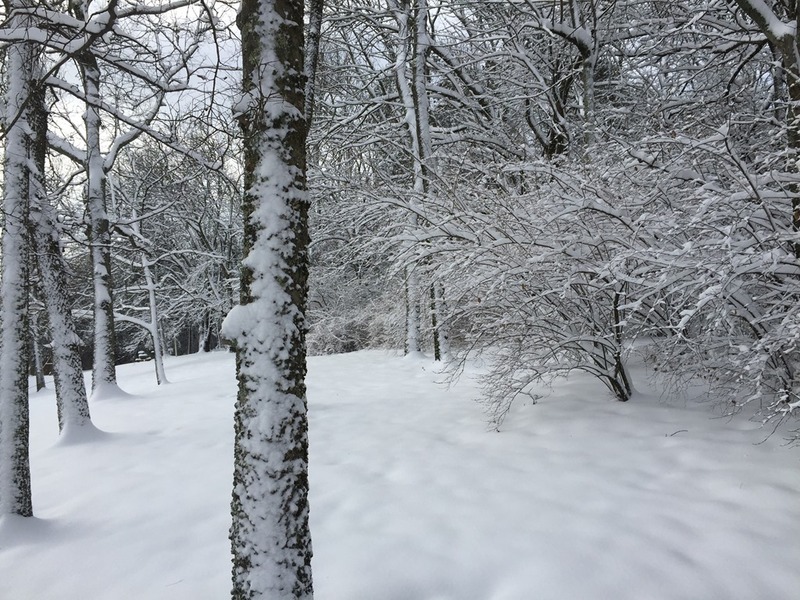 We tromp through the woods behind our house, marveling at the new Narnia-scape. We work puzzles in front of the fire. We have movie nights, and introduce our kids to The Princess Bride, which we quote all the next day. We drink hot chocolate and live off of whatever is in the fridge and the pantry. 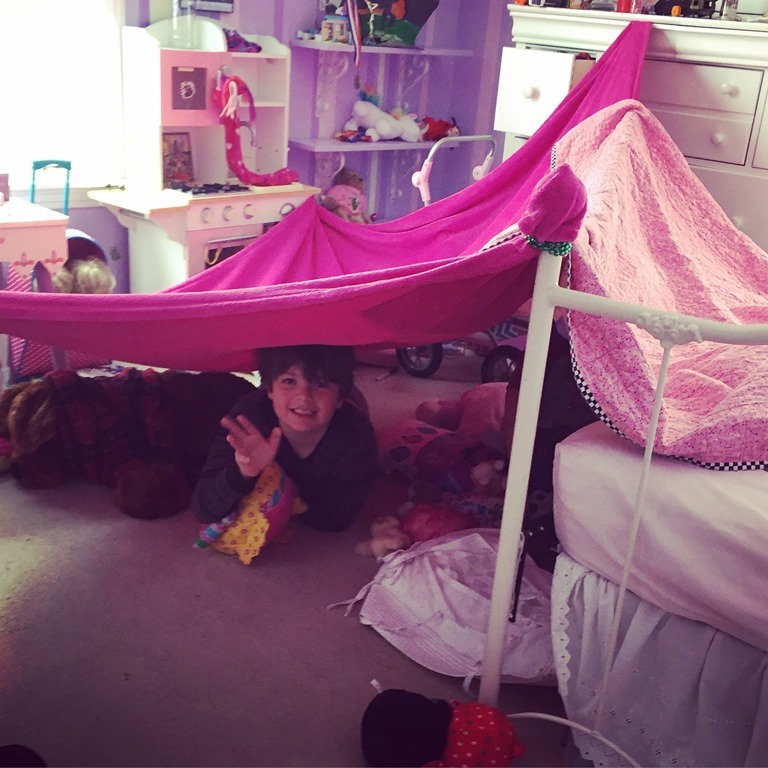 We ban screens, and listen to the kids build tents and play with their stuffed animals. We relax. Of course, we also have to work, but it’s not “important” work. It’s not the work that we describe as a “calling,” or that we believe will change the world. 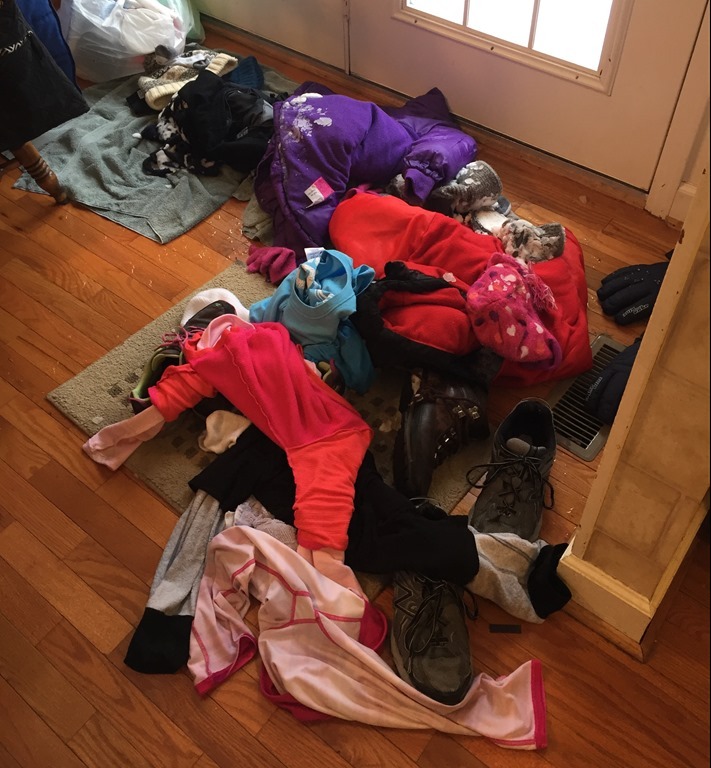 No, it’s the mundane work of washing the same 16 layers of clothing each night, of running dryer load after dryer load of hats and mittens and scarves, of repeatedly mopping snow and water off the kitchen floor, of meal preparation and cleanup. It’s the dull, repetitive work of survival that somehow takes on new life when it’s the only work you have to do, and when it so clearly facilitates your family’s enjoyment of the day. It’s that simple grunt labor that connects you with your humanity and with the reality that labor is inherent in existence. And for me this year, our snow days have done two other things. One, they have challenged me to fully embrace this wild, wonderful life. I’m the type of person who would rather sit inside reading a book and watching the snow fun through the window. And yet, my kids think it’s Christmas if Greg and I go out and sled with them. So, of course, I bundle up in layer after layer, and march my 35-year-old body to the top of our giant hill, plant it on a small plastic sled, and push off. And I feel that familiar exhilaration and excitement and a little bit of fear at the chaos theory being enacted by our hill—you truly never know exactly what path the sled is going to take. I get to the bottom and am dumped out in some way, and then I haul sled and self back up the icy slope to give one of the kids a turn. I’m not a kid anymore, so the up and down is not as easy, and yet I’m still healthy and somewhat young, and it would be criminal not to embrace it. Sometimes as I sit at the top of the hill, I think about how one day (if I’m lucky), I will be old, and my body won’t work right anymore. Maybe pain will be a constant part of my life. Maybe my actions will be severely limited by my failing health. Certainly, these days will be over soon. Certainly, my kids will grow up and be gone. And I hope I still enjoy my life then, even with all its limitations, but I can’t help but think of the longing I will feel when those days come. 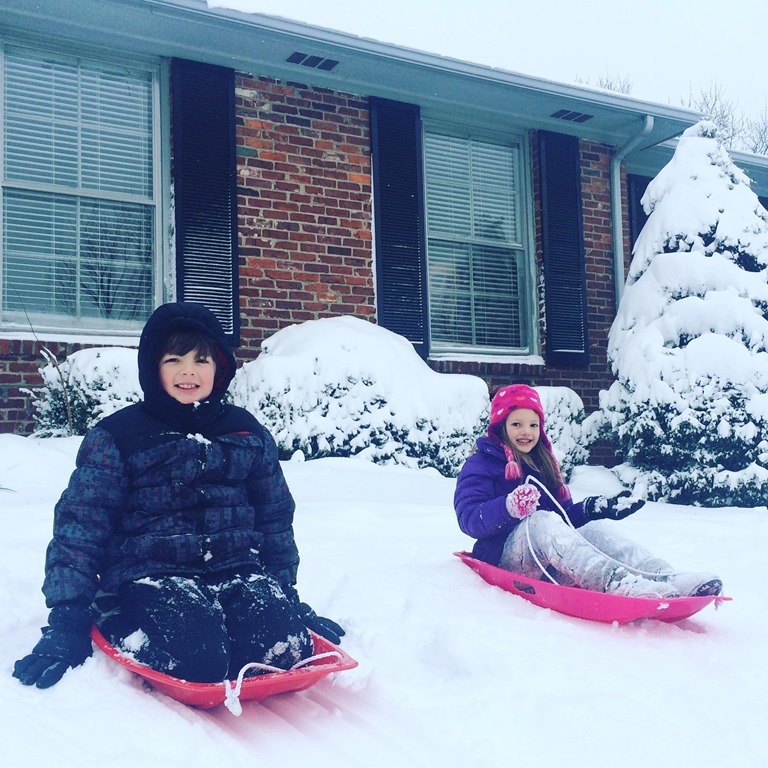 The longing for the time when my kids were young and at home, when Greg and I were healthy and active, when we had snow days where we could sled down hills over and over. 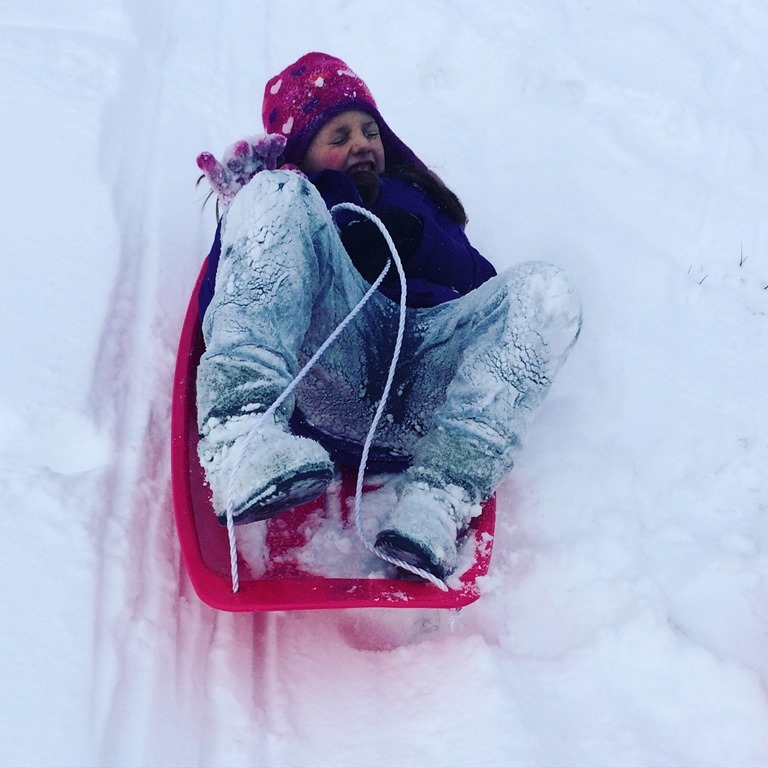 And I feel my future self smiling on this present self, who is sitting on top of a snowy hill on a little sled, and my future self tells my present self, “You made a good choice.” So I push off, and I scream happily at all the bumps and dips, pretending that I’m not going to feel them all the next morning. The other thing these snow days have challenged me to do is to recognize the precious gift that is my family. Just a couple days ago, a poor two-year-old’s body was found after he wandered away from his grandmother while on a hike in the woods. It appears that he died of exposure, a thought that contains such horror and sorrow that my brain shuts off protectively when I start to think of it too much. Also this week, my great uncle died, and actually, if we weren’t snowed in, I would be at his visitation today. In contrast to little Noah, Uncle Donald lived a nice, long life, but even so, it is still so hard for our family when our days on earth come to an end. And as much as we may try to ignore the thought, they will come to an end, and we are not promised a long life like Uncle Donald had. 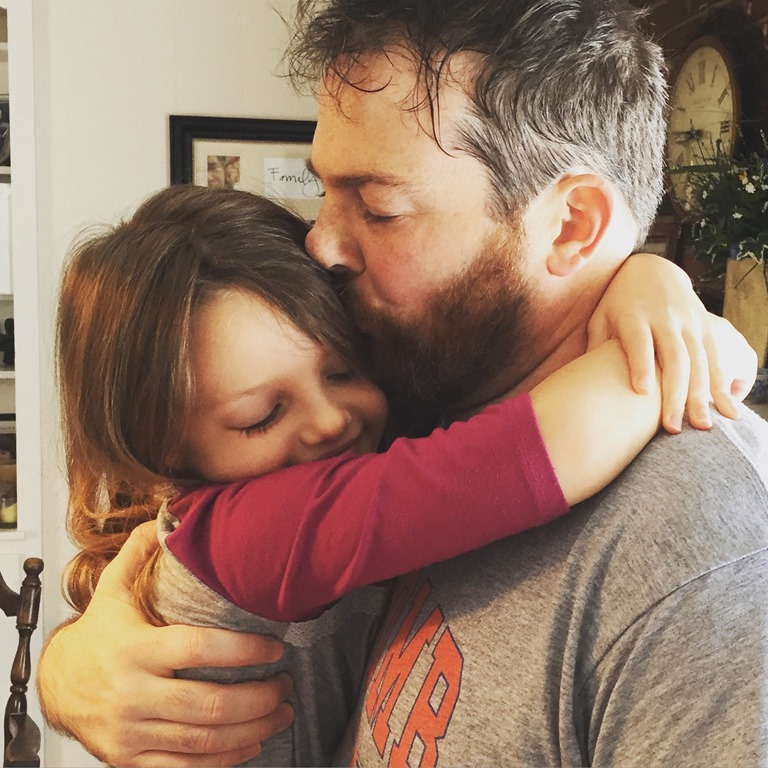 There is a temptation toward fear when faced with that reality, but I choose instead to let it prompt me to gratitude for every second I have with my family. Even those seconds where I am peeling wet jeans off wiggly legs, or vacuuming the same room for the second time in 24 hours because of all the popcorn kernels. Those wiggly legs and errant popcorn are the result of the presence of fragile humans whom I so dearly love. Sometimes it takes something as morbid as death to wake you up to the depths of that love. I have felt those depths during these snow days. I went on a walk around the block today, and ended up shedding my outer coat, hat, scarf, and gloves. It was much warmer, and the icy roads were starting to thaw. I felt my Sabbath melting around me in the slush through which I trudged, and I faced the fact that Greg would head back to work tomorrow, and the kids and I would spend the day doing school. 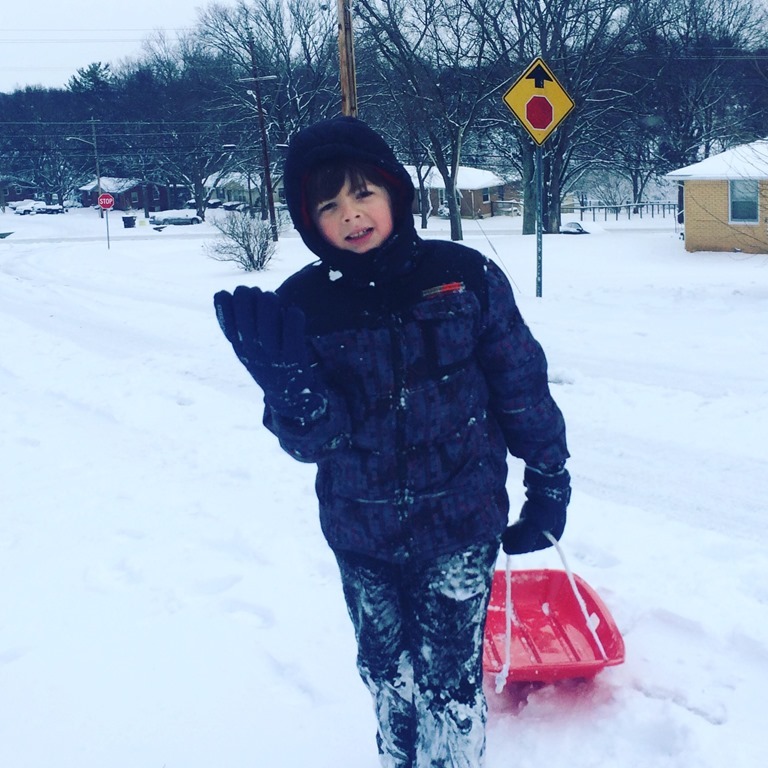 That’s not exactly a tragedy, as I do enjoy our normal life, but I did so cherish this snow day Sabbath, and I loved embracing its invitation to hold tight to this charmed and fleeting life. Kim, Please keep writing! I love your reflections and they are indeed a blessing to my life! Thanks for sharing & for mentioning Uncle Doodle O! We all loved him so much! I agree with your Mom! You should definitely write a book! Love this post! Hugs, dear one!